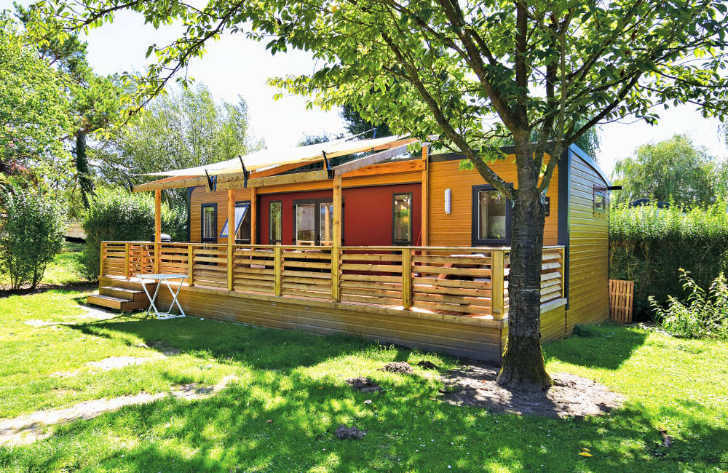 Eurocamp Aspect holiday homes are one of the newer styles of accommodation from Eurocamp. They combine style, comfort and practicality which therefore provide you with a truly wonderful place to stay. Eurocamp have taken previous campers feedback when designing the Aspect range. There were two main areas they concentrated on, firstly comfort and secondly space. Their final aim was to design a range of accommodation to take camping into the 21st century and beyond! As a result technology, design and style has provided a kitchen and living area to fit around your lifestyle. Furthermore, the spacious living area and highly desirable kitchen has floor to ceiling windows throughout. This brilliant feature helps to create a feeling of space and light. Similarly the outside is just as stylish as it’s interior. Outside you’ll find a large covered deck area which helps to bring the outside in and inside out. This therefore increases your living area and promotes al fresco style dining. One of the main advantages with the Aspect range is that all bedding and linen is included in your stay. All beds are made up prior to your arrival consequently giving you that hotel feeling on arrival. It also saves you having to bring your own! The Eurocamp Aspect range offers two alternatives to holidaymakers. Firstly there’s a 2 bedroom Aspect which is 32m2 in size, the same size as some 3 bedroom models in other ranges. Secondly there is a 3 bedroom Aspect which stands at an enormous 40m2. The two bedroom model has a double and twin bedroom and sleeps up to 6, whilst the 3 bedroom model has a double, twin and bunkbed room and sleeps up to 8. One thing that you’ll instantly notice about the Eurocamp Aspect is the range of equipment they have. Each mobile home benefits from standard equipment as you’d expect, but you also get air conditioning, an extra large covered deck and quality deck furniture, a beautiful high gloss kitchen, coffee machine, dishwasher, towels, duvets and linen, bluetooth speaker, radio and even a DVD player and flatscreen tv. If you love the look of the Eurocamp Aspect range and would like to find out more simply click the button below. To take a look at some of the other accommodation from Eurocamp simply visit the accommodation page.